According to Indian astrology, Manglik Dosha is considered as one of the horoscope conditions which mainly occur as a result of the negative or adverse impacts and influences of the planet mars. 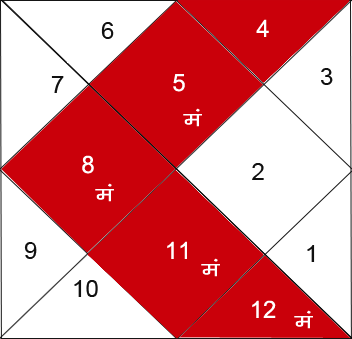 In the horoscope chart of a person if Mars(Mangal) is in the 1st, 2nd, 4th, 7th, 8th, or 12th house of the ascendant chart then it is considered that the person have Manglik Dosha and the person is considered as manglik. This special condition is astrologically believed to be very unfavorable for marriages causing hazards and tension in relationship which can lead to more severe issues and even it can destroy the marriage. In such a situation Manglik kundli solution is the only way which can neutralize all the negative effects of planet Mars so that his/her marriage gains strength for a long lasting and peaceful relationship. What are the general abnormalities caused by Manglik kundli? Unnecessary delay in marriage is one of the leading impacts in this regard. Occurrence of marriage-life troubles that can even result into divorce. Quarrels and clashes in marriage life, emergence of misunderstanding in couples and incapability of having necessary adjustments. Incompatibility in thoughts and marriage. Sudden spouse’s death can also occur in some cases which is really quite shocking. Unwanted disturbances will crop up in professional, social and family. Emotional suffering and unwanted arguments might occur as a result of the same which might hamper the peace and happiness of married life. But the good thing is all the unwanted happenings due to the negative influence of your Manglik Dosha can be resolved by our Manglik kundli solution service. This solution needs to be strictly and sincerely abided by both the future grooms and brides in order to have a safe and peaceful marriage life without any hazards. In such cases depending on their particular horoscope condition, we suggest performing different kinds of powerful yoga, rituals that can remove the Manglik characters from the horoscope chart. The situation can be even more adverse in case other dangerous planets especially Shani and Rahu join mars. Therefor a good amount of astrological analysis is required before suggesting any solution. By performing our Manglik Kundli solution you can confidently step into the divine joining of two souls.